Instagram2Go is the PUP that uses misleading techniques to prevent removal. Use Reimage to locate malicious components and get rid of them faster than with uninstall instructions. A full system scan blocks virus reappearance and prevents traffic to malicious domains. 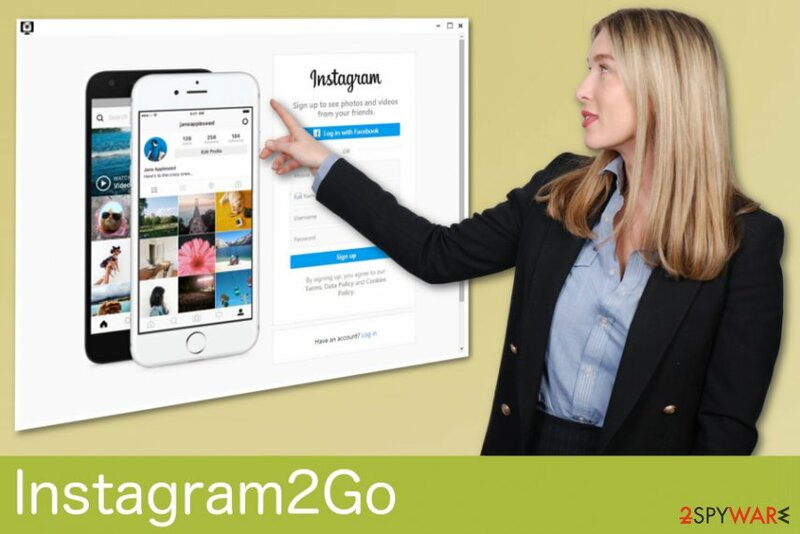 Instagram2Go is a potentially unwanted program that causes redirects to suspicious sites. Adware programs typically focus on creating commercial content and generating pay-per-click revenue for their advertisers. Unfortunately, the constant appearance of advertisements and redirects to questionable domains can cause more issues than a pleasant time online. These redirects can result in the appearance of adware-type viruses, hijackers or even rogue tools on your computer. Besides, Instagram2Go can also start tracking your browsing on the web to know more about your search preferences, location, and similar details. Trying to be precise, we will add that this program can access your PC's IP address, location, mostly-used search phrases, clicks and other information which is considered as non-personal. Nevertheless, after getting into hackers' hands, it can be misused for malicious purposes. Pop-up windows appear with promotions of fake updates or tools. The sluggish computer's performance or browser crashes should make you worried and encourage you to check your PC system for Instagram2Go virus. Besides, pay attention to the signs posted above. No matter that this app is not malicious, you should not keep it on your system. There are more cons than pros related to dealing with it. You need to remove Instagram2Go from your device if you want to stop data tracking behavior and similar activities behind your back. According to cybersecurity researchers, the best way to do this is to use anti-malware tools. We can recommend using Reimage but feel free to chose any other trustworthy security program you like. Since PUAs can install other tools or intrusive programs, we highly recommend opting for a full system scan while performing Instagram2Go removal on the system. Anti-malware tools will scan your system and remove detected threats with no effort. 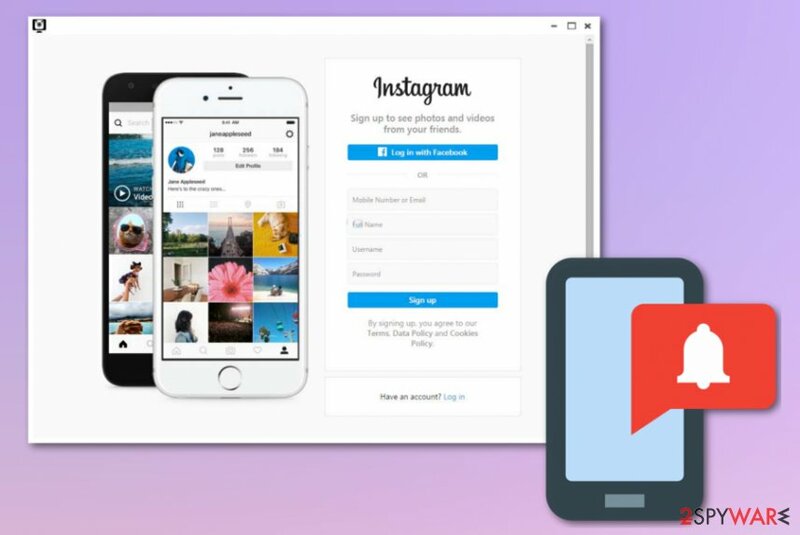 Instagram2Go virus is related to third parties seeking to increase their sales and visitors' traffic. Because of this fact, it delivers an excessive amount of ads to your screen. Using peer-to-peer sites or other free sharing platforms can be useful and easy. However, getting software or updates from sources that are not legitimate can put the security of your device at high risk. Freeware providers bundle their products with unwanted programs and spread these bundles online. When you are getting software or applications and choosing Default options as installation settings, you may get additional programs. The only way to avoid these infections besides choosing legitimate sources is opting for Advanced/Custom settings during the installation process. This step allows you to see the full list of programs and de-selecting additional or unwanted ones. This is an easy way to avoid any cyber infection since many silent intruders tend to come this way. To remove Instagram2Go from your computer, you need to employ a reputable anti-malware program. This tool performs a full system scan, detects corrupted files, outdated software or drivers, and, most importantly, finds all the possible threats and silent intruders. This tool not only detects malware but also removes it from the system for good. To delete all those extensions and additional programs, you need to scan your whole system. PUPs can be persistent and renew themselves if you are not terminating all related files, so feel free to use a few anti-malware programs for Instagram2Go removal. We have a few suggestions but feel free to choose what you like. Scan your device a few times to double-check that all possible threats are eliminated. Here, look for Instagram2Go or any other recently installed suspicious programs. Wait until you see Applications folder and look for Instagram2Go or any other suspicious programs on it. Now right click on every of such entries and select Move to Trash. When in the new window, check Delete personal settings and select Reset again to complete Instagram2Go removal. Once these steps are finished, Instagram2Go should be removed from your Microsoft Edge browser. Here, select Instagram2Go and other questionable plugins. Click Remove to delete these entries. Now you will see Reset Firefox to its default state message with Reset Firefox button. Click this button for several times and complete Instagram2Go removal. Here, select Instagram2Go and other malicious plugins and select trash icon to delete these entries. Click Reset to confirm this action and complete Instagram2Go removal. Here, select Extensions and look for Instagram2Go or other suspicious entries. Click on the Uninstall button to get rid each of them. Now you will see a detailed dialog window filled with reset options. All of those options are usually checked, but you can specify which of them you want to reset. Click the Reset button to complete Instagram2Go removal process. ^ Smartphone data tracking is more than creepy – here’s why you should be worried. Theconversation. Research, analysis and news. ^ Advantages and disadvantages of pay-per-click advertising. Nibusinessinfo. Practical advice for business. This entry was posted on 2018-08-30 at 06:02 and is filed under Adware, Viruses. You can quickly scan the QR code with your mobile device and have Instagram2Go manual removal instructions right in your pocket. 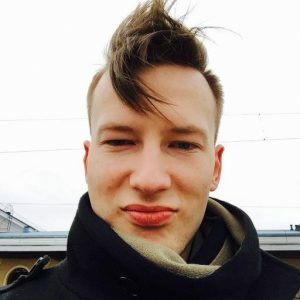 How did you remove Instagram2Go?